Worried that foreign travelers -- especially those entering the U.S. from Mexico -- will be insulted by intrusive security pat-downs in airports? Well, rest easy: Janet Napolitano is on the job. About 84 million Mexicans are expected to qualify for the trusted traveler program [who] will get the perk through the U.S. government’s Global Entry Program... Applying is easy. Candidates fill out an online application, provide valid identification and answer a few questions from a Customs and Border Protection officer. 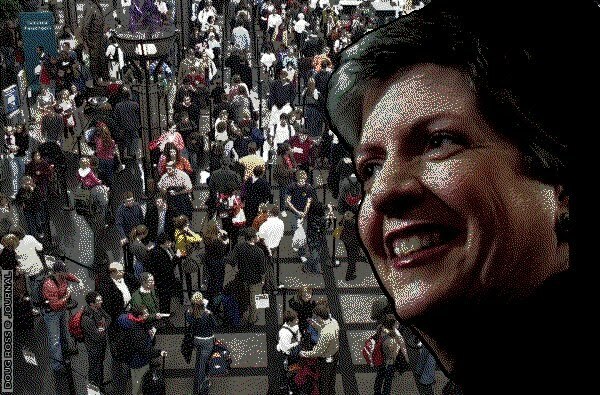 While Napolitano was in Mexico finalizing the trusted traveler agreement this week, she also took the opportunity to sign a “letter of intent” to develop a plan for protecting immigrants from criminal attacks as they cross the border—illegally—into the U.S. Mexican officials have long complained that American law enforcement officers stand by as illegal immigrants are robbed, killed or violently beaten. Napolitano has committed to reducing the risk to life and security of migrants, according to the Mexican minister. Doug suggests that “Napolitano will refer to this program as "Skipping the Airport Screenings Americans Won't Skip." Prescreened. What a joke. We can’t even keep bedbugs out of the country. We have met our Neville Chamberlain: and she is not just a moron, she is also a collaborator. 2012. Faster, please.